Since the 2007 economic recession,First published in Log 27 (Spring 2013). the culture of architecture has witnessed the rise of activism and participatory practices. With the 1990s avant-garde architects on the decline of political correctness, we are witnessing a new wave of socially concerned architecture. Symposiums, exhibitions, biennales, magazines, and journals have amplified this phenomenon by promoting new ways of practicing architecture that invest design with a social and political mission. The new generation of young architects feels the urge to focus not on aesthetic and formal concerns, but on the improvement of our urban condition. In conferences and discussions about architecture one often hears the lament that in the past twenty years architects have overindulged in useless formal acrobatics and irrelevant theoretical discussions and shown little responsibility towards issues such as public space, housing, and other “socially oriented” topics. Paradoxically, while the recession is forcing many people to live in very precarious conditions, many young, socially concerned architects see the crisis as an opportunity for their creative acts The crisis is “forcing” the architectural discipline to be more inventive, more disposable, more astute in finding ad-hoc solutions for our crumbling urban condition. It happen to someone looking back over his life that he realized that almost all the deeper obligations he had endured in its course originated in people who everyone agreed had the traits of a “destructive character.” He would stumble on this fact one day, perhaps by chance, and the heavier the shock dealt to him, the better his chances of representing the destructive character. The destructive character knows only one watchword: make room. And only one activity: clearing away. His need for fresh air and open space is stronger than any hatred. The destructive character is young and cheerful. For destroying rejuvenates, because it clears away the traces of our own age; it cheers, because everything cleared away means to the destroyer a complete reduction, indeed a rooting out, out of his own condition. Really, only the insight into how radically the world is simplified when tested for its worthiness for destruction leads to such an Apollonian image of the destroyer. This is the great bond embracing and unifying all that exists. It is a sight that affords the destructive character a spectacle of deepest harmony. The destructive character is always blithely at work. It is Nature that dictates his tempo, indirectly at least, for he must forestall her. Otherwise she will take over the destruction herself. The destructive character sees no image hovering before him. He has few needs, and the least of them is to know what will replace what has been destroyed. First of all, for a moment at least, empty space –the place where the thing stood or the victim lived. Someone is sure to be found who needs this space without occupying it. 2. Walter Benjamin, “The Destructive Character,” in Walter Benjamin: Selected Writings, Volume 2, part 2, 1931–1934, ed. Michael W. Jennings et al, trans. Rodney Livingstone (Cambridge: The Belknap Press of Harvard University Press, 1999), 541. To a certain extent “The Destructive Character” can be read as a paradoxical ode to the same aggressive forces – capitalism and fascism – that would threaten the life of people, and especially the working class, in the 1930s. If the 1910s and ’20s saw the revolutionary forces of socialism and communism challenge the hegemony of capitalism, the 1930s were a period of restoration of capital through fascist repression in Europe and the advancement of welfare state politics in the US. This project would culminate in a final blow to workers: the 1939 pact of nonaggression between Hitler and Stalin. Benjamin’s destructive character is thus an image of the destructive impetus that would force many lives – including his own – to be uprooted and annihilated. The essay is thus autobiographical: it refers to the increasingly precarious life of its author, who, unable to secure a stable professional position, earned his living by writing occasional pieces for journals, newspapers, and radio programs. On top of this he endured an excruciating divorce from his wife, the forced separation from his son Stefan, the ending of his tormented relationship with Asja Lācis, and constant changes of domicile.3. See Esther Leslie, Walter Benjamin (London: Reaktion Books, 2007). This last seems to have been one of the fundamental traits of Benjamin’s life. Indeed, there is no other intellectual, not even in the dramatic decades of the 1930s and ’40s – when millions of people were forced to move from their place of origin – who changed address so frequently. The beginning of the short essay clearly points to a situation in which the destructive character is personified by non benevolent figures: those to whom we endure all our deeper obligations. With such a statement Benjamin makes clear that the source of the destructive character is not a liberating force, but an oppressive one. And yet for Benjamin it is precisely the sudden realization – the shock – that our life depends on forces that are in essence destructive that introduces us to the use of such forces or our own sake. This is a fundamental point in the way Benjamin categorizes destruction. Unlike the art of building, which from Vitruvius to Alberti is identified not just as a technical expertise but also as having ethical and moral value, pars destruens refers to annihilating forces and thus to the loss of any value, of any stable point of reference. In spite of Benjamin’s early taste for romanticism, and later for the hopeless pessimism of German baroque drama, he seems to have no illusion about the destructive character: the destructive character can only be embraced by accepting it as a force inherited from those who threaten our existence in the most fundamental way. There is no doubt that, albeit within a materialist dimension, “The Destructive Character” can be read as the cusp of Benjamin’s apocalyptic messianism, a “negative” that evolves throughout his entire oeuvre, as well as in German Judaism in general. Commenting on the 1930 edition of Franz Rosenzweig’s Star of Redemption, Benjamin’s friend and theologian Gershom Scholem remarked that the theory of catastrophes implied by apocalyptic messianism breathed fresh air into the tradition of Judaic theology in the 1920s.4. See Tamara Tagliacozzo, “Catastrofe, Distruzione, Redenzione. Sionismo e messianismo apocalittico in Gershom Scholem”, Seminario di Studi Benjaminiani (edited by), Le vie della distruzione. A partire da Il carattere distruttivo di Walter Benjamin (Macerata: Quodlibet, 2010). The awareness of a looming catastrophe supported the idea that there was always a potential for destruction within the historical time of the secular world. For Scholem, redemption was both a liberating force and a destructive one, and this issue was precisely what many Jewish theologians had tried to avoid. Such theological desire for destruction was echoed if not inspired by the political, social and economic reality of the Weimar Republic, the turbulence and instability of which was for Benjamin mirrored in the hopeless atmospheres of the German baroque drama, the acid sarcasm of Dadaism, and the desperate subjectivity of expressionism. And yet, at the time of “The Destructive Character” Benjamin was no longer indulgent of the melancholic character of the protagonists of baroque drama or the anarchism of artistic avant-gardes such as Surrealism and Dadaism. After having analyzed in Passagenwerk the archaeology of his contemporary capitalist metropolis, Benjamin saw no room for romantic rebellion. The destructive character, the will to destroy established forms and values, had to be organized as the struggle of the proletariat against capitalism. Indeed, through his observations on Paris, Benjamin discovered the nexus that binds together technology, urban form, and capitalistic power, and noted that in the 19th century the arcades introduced a new architecture made of the most advanced materials and forms. For Benjamin these crass and valueless commercial spaces had the potential to threaten the reassuring gemütlichkeit of bourgeois domesticity. Even the urban form imposed on Paris by the reactionary Baron Haussmann after the revolution of 1848 was, for Benjamin, the appearance of a new and radical urban experience. Haussmann’s dramatically new circulation system of boulevards gradually replaced the old medieval topography of Paris with a landscape of endless runs of the same kind of façade. Even if these transformations were advanced to counter the threat of another revolution (which eventually occurred in 1871), the ruthless character of Haussmann’s urban operations had the effect, as Benjamin noted, of disorienting the bourgeoisie’s trust in their own city.5. See: Walter Benjamin, The Arcades Project (Cambridge Mass. : Harvard University Press). Yet, in Benjamin’s opinion the dreamlike scenario in which these disruptive urban transformations took place had preserved the capital from being annihilated by its own destructive power. Seen from the vantage point of 20th-century Berlin, Paris, the capital of the 19th-century, was interpreted by Benjamin as both a warning and a chance. When Benjamin was writing “The Destructive Character,” Berlin was a city of both cultural emancipation and regressive social conditions. Benjamin saw Berlin as both the city where new experimental urban projects were being developed by a radical city planner like Martin Wagner – who, together with Bruno Taut, designed the Heufeisen Grosssiedlung in Berlin Britz – and the “stony” city, harshly criticized by Werner Hegeman, where inhumane housing conditions such as those manifested in the infamous rental houses – the Mietskaserne – affected the majority of the urban proletariat. Confronted with this contradictory landscape, Benjamin saw Berlin as the place in which the destructive character of modern urban experience could be radicalized in the form of a tabula rasa – a messianic Jetztzeit – that would turn the brutal forces of capitalist development against themselves in the form of a proletarian revolution rising up from the most reified human subjectivity. For its own sake, this revolution had to assume the disenchanted and cheerful spirit of the destructive character and turn it against the powers from which it originated. A fundamental point of reference for Benjamin’s tabula rasa was the literary work of Paul Scheerbart and the theater of Bertolt Brecht. In very different ways Scheerbart and Brecht attacked the most enduring values of bourgeois culture. In 1914 Scheerbart published Glasarchitektur, a treatise on architecture centered on the idea that the whole built world could be transformed into a landscape of total transparency.6. See Paul Scheerbart, Glasarchitektur (Berlin: Verlag Der Sturm, 1914). With this book Scheerbart attacked the bourgeois interior, the fixed architecture of the 19th-century apartment in which the ruling class had cultivated its idea of domestic comfort. However the Scheerbart’s idea of building architecture in transparent materiality was motivated not only by a desire for transparency per se, but also by the idea that the character of the domestic interior should be completely indifferent to the life of its inhabitants. In a house made of glass, traditional dwelling was made impossible because the inhabitants would not be able to leave traces on the glass. In this way domestic space would be freed from the burden of personal identity and would allow inhabitants to always start their daily existence afresh. Scheerbart’s architecture can be considered a tabula rasa insofar as it intended to remove any ornament, any superfluous object, and to reduce domestic space to its bare essence of empty and transparent spaces. His idea of total transparency and removal of any sense of interiority is also reflected in the protagonists of his novels. As Benjamin noted, Scheerbart’s fiction was populated by figures devoid of any psychological characteristics, completely transparent in their thoughts and intentions. Moreover, their positive relationship with technology allowed them to be completely free of natural resources. Scheerbart thus showed Benjamin the possibility of a completely constructed and artificial world in which any myth of nature was erased and technology, rather than producing the phantasmagorical landscape of the Parisian arcades, gave form to a straightforward, objective urban condition. For Benjamin the science fiction aspect in Scheerbart’s literary work was the result of the naïve amazement with which he described the achievements of new building techniques. Benjamin also saw this quality in the theater of Brecht. Like Scheerbart’s architecture, Brecht’s theater was devoid of psychology and completely invested in the actions of its protagonists. For Benjamin, the target of Brecht’s destructive character was the idea of artistic creativity, the alibi through which art and literature had always been removed from the broader world of material production.7. See Benjamin, “Bert Brecht,” in Selected Writings, 365–71. By destroying any sense of psychological refinement in his plot, Brecht made his dramas available as pedagogical devices at the service of participatory spectatorship. In both Scheerbart’s books and Brecht’s theatre, Benjamin found the possibility for a “sober” language that was appropriate to his goal: the invocation of a messianic revelation from within the most extreme experiences of modernity. Developed between 1912 and 1916, Le Corbusier’s Dom-ino model gained momentum at the beginning of World war I when the destruction of villages in Belgium and France made clear that housing would be a high priority for many European governments after the war. Le Corbusier sought to seize this as the opportunity to promote large-scale reform of housing conditions, thus making clear the link between destruction and uncertainty and the possibility for establishing new living conditions. For Le Corbusier, the Dom-ino model was not only a house, but also the place of social reproduction and the center of architecture’s radical reinvention. In order to give physical form to his new vision, he developed a structural skeleton composed of horizontal slabs and pilotis, which left the completion of any internal partitions and finishings to the building’s inhabitant. This reduction of architectural form to structure is the crucial aspect of the Dom-ino model. In this reinvented context, architecture becomes mere framework, and the most important consequence of this model – its success and diffusion in architecture is indisputable – is the elimination of walls and façade as fundamental creators of architectural space. Of course, façade and walls still exist in the Dom-ino model, but their presence is always relative to the ad-hoc use or situation.8. One of the most accurate and interesting discussions of the genesis Le Corbusier’s Maison Dom-ino is in Adolf	Max Vogt, Le Corbusier, The Noble Savage (Cambridge: MIT Press, 2000). Importantly, Maison Dom-ino was the first time that the technique of the free plan, which was used strictly for utilitarian buildings such as factories and storages, was used for a house. The free plan consists of an unobstructed space in which only structure remains. The concept of the open plan is to accommodate whatever programs or activities are needed. The technology of the open plan was developed with the rise of industrialization in order to contain the fast changing modes of production, both material production, like the Fordist assembly line, and immaterial production, like office space. In open-plan factories and offices, interior space is literally emptied out of traditional architectural elements such as ornament and interior partitions, and reduced to a tabula rasa of open-ended floors punctuated by slim columns. The logic of the free plan was motivated by the need to contain the ethos of industrial labor and its ever-changing spatial logic. The generic nature of such space addresses precisely the deepest anthropological condition of man reduced to the basic properties of his species: a lack of specialized instincts, which results in human unpredictability in terms of actions and reactions. The more this aspect of human nature becomes the essence of the labor force exploited by capital, the more space must become neutral in order to contain any unforeseeable condition. In the Maison Dom-ino this reality is exposed in a degree zero of architectural form: the load-bearing structure. Here the tabula rasa of industrial production finally conquered domestic space, de facto destroying any sense of interiority and opening the house to any interpretation. From the perspective of the social and political emancipation of workers, Maison Dom-ino showed both the promise and the threat of new building techniques. The Dom-ino model was an unprecedented flexible building system capable of producing unforeseen spatial arrangements for its inhabitants, but as the Dom-ino model proliferated, that flexibility and adaptation became an apparatus of social and political control. Le Corbusier’s goal for the Dom-ino system was to link the design of the housing unit with the development of the city as a whole. This concept was unprecedented. If city planning manuals such as Camillo Sitte’s City Planning According to Artistic Principles, or Reinhard Baumeister’s Town Extensions conceived the design of cities as a composition of urban blocks, squares, streets, and monuments, Le Corbusier was the first to conceive of city making as departing from the basic housing unit. This principle was later theorized by Ludwig Hilberseimer in his book Groszstadtarchitektur, where he wrote that the design of cities must address the two extreme poles of urban development: the individual cell and the overall urban circulation system.9. See Ludwig Hilberseimer, Metropolisarchitecture, trans. and ed. Richard Anderson (New York: GSAPP Source Books, 2012). In Le Corbusier’s model the link between the single domestic unit and the totality of the city is made even stronger by the way in which the Dom-ino model was to be produced. While the steel form needed for the concrete was to be prefabricated, the concrete itself would be poured in situ. This construction method combined the logic of industrial mass production and unskilled labor to accomplish these simple operations. The radically simple architecture of the Dom-ino model was thus not only the result of the logic of the open plan, but also reflected the subjectivity of its builder-inhabitants, who are forced to build by “starting from scratch” with few means and readymade techniques. While Le Corbusier failed to put the Dom-ino model into practice, its implicit logic is today ubiquitous in housing construction systems that combine the formal procedures of steel-reinforced concrete and the “informality” of do-it-yourself building practices. For this reason, despite the tabula rasa effect that destroyed the 19th-century domestic interior so hated by Benjamin, the Dom-ino model established a new idea of private property that is no longer represented by the “traces” left by the inhabitants’ abundance of furniture and interior decoration so typical of the 19th-century bourgeois house. In the Dom-ino model private property is represented by the possibility of self-construction, which automatically makes the inhabitant the owner of her/his house. As history has shown, this model has often been applied to tame and control subjects by allowing them to build their homes in the cheapest way possible, thus turning them into small entrepreneurs of their respective households.10. See Pier Vittorio Aureli, Maria S. Giudici, Platon Issaias, “From Dom-ino to Polikatoikia,” Domus 962, October 2012. Here again the Dom-ino model was, at the time of its conception, both a promise and a threat. Its promise of a new beginning for an emancipated form of life was threatened by the possibility of turning the construction of the basic frame itself into a vehicle for what Benjamin feared the most: the enduring logic of private property, which was embedded in the very constructive logic of the Dom-ino model. The Dom-ino is thus the most radical example of how, from the very beginning of modern architecture, the design of the city was proposed from within the micropolitics of the individual unit. Meyer proposed the Co-op Zimmer as a solution for an increasingly mobile population. At the time of his project, a large part of the population in big cities like Berlin was frequently forced to change homes because of the extreme precarity of the economic situation. Meyer, like Benjamin would in the 1930s, forced himself to see in this new condition the possibility for a form of life uprooted from the sense of possession represented by the domestic interior. The latter is reduced to an empty space, which makes clear that permanent occupation is impossible. Meyer’s design seems to address the same living conditions that Benjamin recorded with sober sympathy during his visit in Moscow in 1926. Contrary to the petit bourgeois house and the “completeness” it manifested with items such as pictures that cover walls, cushions on the sofa, and ornaments filling the mantelpiece, the houses in Moscow were made up of bare rooms sparsely furnished. 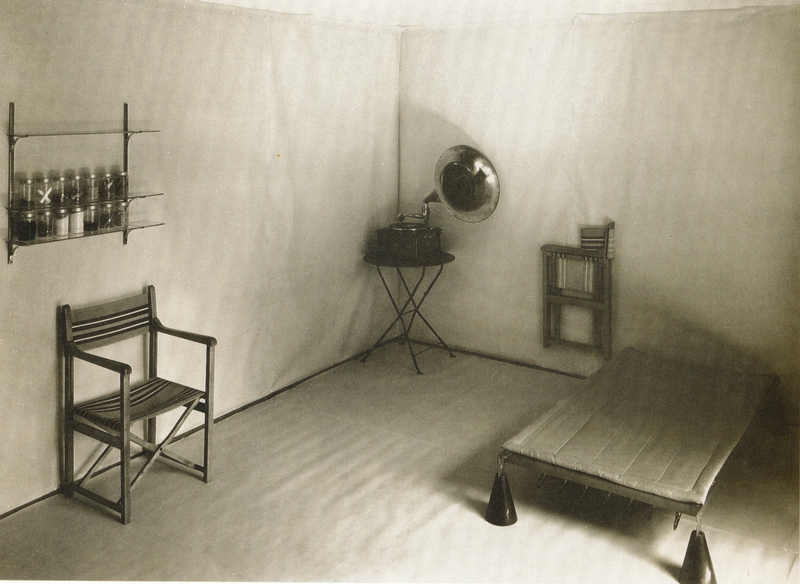 “Weekly the furniture in the bare rooms is re-arranged; this is the only luxury indulged in with them, and at the same time a radical means of expelling “coziness” – along with melancholy with which it is paid for – from the house. People can bear to exist in it because they are estranged from it by their way of life. Their dwelling place is the office, the club, the street.”12. Walter Benjamin, “Moscow,” in Selected Writings, Volume 2, 1927–1934, 22–46. Once the private room is reduced to a minimum, people can fully engage in collective life. The destructive character that originated in the sense of precarity and impermanence of places like Berlin and Moscow in the 1920s becomes the possibility of constantly starting anew, a form of life that sees life itself (and not architecture) as a constant reinvention, a perennially unfinished project. Arguably, while the potential inhabitant of the Dom-ino house may be the working class turned small-owner-entrepreneur of his own household, the inhabitant of the Co-op Zimmer is the city-dweller turned ascetic. In the Co-op Zimmer there is no need for further development, and the inhabitant can focus on her/his ars vivendi, which is the very object of ascetic practices. As in the case of the destructive character, the tabula rasa effect of both Maison Dom-ino and the Co-op Zimmer is first produced by conditions that are far beyond the decision of the author (the architect or the inhabitant). These projects make clear that the destruction of bourgeois interiority and the rise of the bare forms of modern architecture were due to the rise of capital and its new forms of production. As Benjamin wrote in “The Author as Producer,” the author can only decide his/her position within the forces of production. And yet, as in Benjamin’s case, capital’s destructive character is, in these two projects, made manifest with an unprecedented intensity that itself becomes liberating. In these two projects architecture is liberated by design, by the architect’s pretension to shape everything according to his creative genius. It is not difficult to see how the two projects embody the ethical project Benjamin developed. In both Le Corbusier’s Maison Dom-ino and Meyer’s Co-op Zimmer, the architects are not filling the emptiness they have created with another kind of interior, another style, another interpretation of space. These two projects are simply empty space whose contents will exist only in a state of constant uncertainty, always about to disappear, to be removed, to be thrown away. And yet, while the Dom-ino aims to root the subject in the conditions of home ownership, Meyer’s room suggests the opposite scenario: here human subjectivity is finally liberated from the comfort of interiority and can shape itself according to a deliberate form of life no longer mediated by design. But who is the subject of this tabula rasa, who is the inhabitant of this perennially empty space? Perhaps the answer to this question is offered by the text that must be read as pendant to “The Destructive Character”: “Experience and Poverty.”13. Walter Benjamin, “Experience and Poverty”, in Ibid. pp. 731-736 Here Benjamin focuses on the ethos of modernity in which human experience itself is no longer transmissible within the epic narratives of the past. For Benjamin, poverty of experience does not imply personal poverty, or even an ascetic restraint from the abundance of things and ideas that a capitalistic society produces. On the contrary, poverty of experience is precisely the effect of this abundance. Inundated by all sorts of information, stories, and beliefs – “the oppressive wealth of ideas that has been spread among people, or rather has swamped them entirely” as Benjamin put it – we can no longer trust the depth and richness of human experience. Living in a context of constant cognitive stimulation, what we experience is no longer effectively communicable. If in the past lived experience was transmissible through the “long-winded eloquence” of proverbs and charismatic narratives, the impact of modernity on the soldiers who survived War World I made communicable experience impossible. For Benjamin the new poverty of human experience produced a new subjectivity, which he defined as barbarism. Benjamin celebrated the new barbarians, because within the tabula rasa of their impoverished experience they could find the possibility “to make a new start; to make a little go a long way; to begin with little and build up further.”14. Ibid. 732. It is interesting to note that Benjamin associates the new barbarians with constructors who, with very few means – a crude statement or simple observation, like Descartes’s icastic statement, “I think, therefore I am” – are able to build a new state of things. And indeed, among artists and writers, new barbarians who assume the “positive energy” of tabula rasa, there are also architects like Adolf Loos. According to Benjamin, Loos’s opposition to the nostalgic longing for past styles was the only approach that would turn the negative energies of an impoverished world into a positive “constructive energy.” Here it is interesting to note how Benjamin, facing the reality of impoverished experience, takes the same position on the apocalyptic energy of the destructive character. Impoverished experience is the outcome of the most “horrific” forces at stake in modern society at the beginning of the 20th century. Benjamin makes every effort to avoid any idealization of them. Moreover, he makes clear that what has been lost – the art of experience – was something great, something that ennobled human nature. And yet it is precisely the decision to seize upon the poverty of experience as a tabula rasa that transforms its negativity into a possibility, the possibility to create a sudden rupture through which a new condition can be established. In the appropriation and reorientation of the catastrophic impact of the destructive character and impoverished experience, one can see Benjamin’s understanding of the messianic within class politics. At the beginning of the 1930s, especially after his encounter with Brecht, Benjamin was very oriented toward materialism, and both “Experience and Poverty” and “The Author as Producer” seem clearly to point in this direction. Yet it was precisely at this point that Benjamin’s political theology – his longing for a sudden and messianic redemption – seemed to intensify in his work, until the climax of the “Theses on History.” Unlike in Christianity, in the Judaic tradition redemption means the advent of social and political justice, like the liberation of the people of Israel from their foreign oppressor. This concept refers specifically to the liberation of Jews from their slavery under Egyptian rule, and in this context the messiah is someone sent by God to liberate the people of Israel.15. See: Riccardo Di Segni, “I testi: Torà e Talmud”, in Ilana Bahbout, Dario Gentili, Tamara Tagliacozzo, Il Messianismo Ebraico (Firenze: Giuntina, 2009), pp. 9-16. In hard times, the figure of the messiah and the concept of redemption are conceived as the sudden overthrow of the social and political status quo. Since the 1920s Gershom Scholem had maintained a strong separation between the Zionist project of liberation put forward by the people of Israel and the religious dimension of messianic salvation, and Benjamin linked the latter to his historical materialist approach. The destructive character too can be seen as precisely the moment in which a catastrophic event corresponds to the possibility of salvation. This movement from catastrophe to salvation is also evident in the last part of “Experience and Poverty,” where Benjamin makes clear that it is precisely the loss of humanity that represents a possibility for humanity’s redemption. Yet Benjamin situated this movement of loss and salvation not as a general redemption of humankind but as materialist politics for the oppressed class. The idea of a sudden ending of the status quo evoked by messianic salvation was thought by Benjamin to be instrumental to the oppressed class, because such a sudden stoppage was a fundamental critique of capital’s deus-ex-machina: the idea of history as linear time, as progress toward the better. Benjamin knew the story about the Communards, who, when they took Paris in 1871, first shot out the clocks. This gesture made clear that the first enemy of those oppressed by capital is the idea of historical time as a linear development. Through theology, Benjamin entered the very materialist core of capitalistic oppression, that is, the unconditional belief that we are destined to be part of the unstoppable development of our means of production – technology, science, and all the forms of social and political injustice that the development of our productive (and reproductive) apparatus has historically always triggered. Here lies the decisive point on the theology of tabula rasa and its relationship to the activist impetus in architecture that is resurfacing in our own historical time. The activist and participatory practices that are so popular today are the latest iteration of a reformist syndrome whose pathology is to preserve social and political conditions as they are. For example, much of the design rhetoric on sustainability is based on the dilemma between survival or extinction. Confronted with such a dilemma, which focuses on the bare state of the nature of humanity, the culture of architecture is forcefully invited to do something, to be responsible, to find a solution. In other words, the rhetoric of sustainability eliminates apriori any possibility of a negative response. Within such rhetoric we are condemned to optimism. The ethical project advanced by Walter Benjamin in the essays discussed here puts forward a radically alternative position. The theology of tabula rasa implies that we are no longer expected to do something; rather, we should make room, we should create the space for something else to happen. This act of making space (rather than creating something) requires the gesture of stoppage and starting again from scratch. The energy for such a gesture will come not from the invocation of some metaphysical void, but from the very sense of vacancy that inhabits our postrecession urban landscape. Instead of solving this vacancy, we need to invent a new architectural language that, in the same powerful way as Meyer’s Co-op Zimmer, will give radical form to this vacancy without filling it. Such an architectural language will have as its main goal not the restoration of good values, nor will it give to our increasingly precarious city a pleasant image. Rather, this language will hold the promise of salvation and redemption, as it is already latently embedded in a condition where we really have nothing to lose, because surely we will possess nothing. Only then will the destructive character no longer be the forces to which we endure our deepest obligations, but rather the possibility of starting anew, starting something truly different.